I am counting down the days until the weekend. This weekend is the beery-ribsy-pulled-porky weekend I have been waiting for. Yes Grillstock is here at last! Apart from the barbeque extravaganza, I have a couple of days either side in one of the best cities in the South, Bristol, home to a great many awesome breweries. In the area, there’s Bristol Beer Factory, Arbor Ales, Zero Degrees, RCH, GWB and Bath and they’re such a friendly bunch. 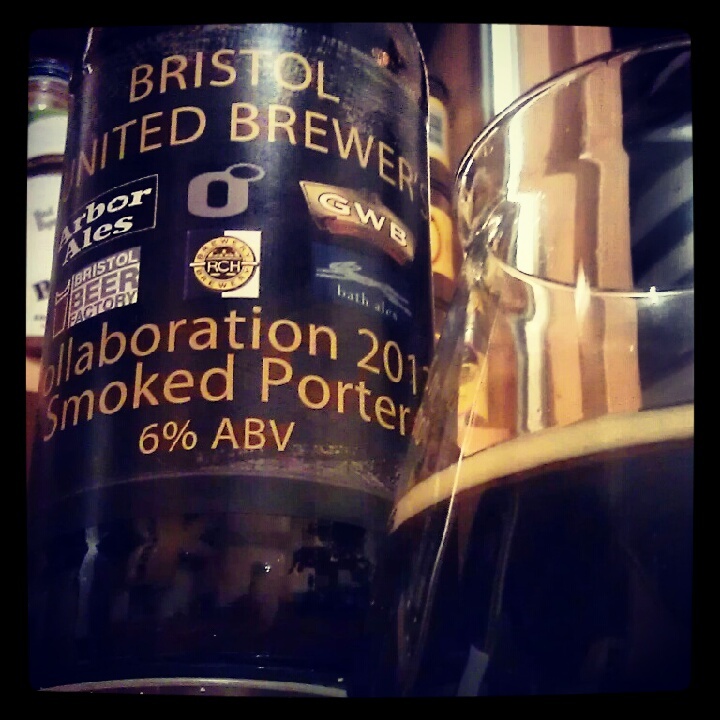 So friendly they got together this year to produce the Bristol United Brewers Collaboration Smoked Porter. Well I’ve never had a beer made by so many different brewers and honestly, I was ever so slightly concerned that this would involve too much compromise. How does that even work? Does everyone just chuck a little something in and hope for the best? Clearly not – my partner and I have just bought a load of kit with the intention to start home-brewing and it looks like I’m about to open Frankenstein’s lab there’s so much science involved! This must have been quite an interesting operation but is it any good? First impressions say oooh yes indeed. Wow that aroma! So roast toasty with fruit and nuts and a touch of cola. Not a lot of smoke but I don’t miss it. There’s not much smoke in the taste either until a tiny waft right at the back but who needs it with a beer this deliciously rich. The mouthfeel is velvety and thick and it’s brimming with coffee and hazelnuts, cut through with the tangy orange of the hops.There’s a little candy sweetness through the soft center. and a slightly herbal hoppy bitterness through the end which makes the mouth water. Not a very well-smoked porter but still very beautiful.